Northumbria Police has seen stalking related-arrests rise from 9 in 2016/17 to 316 in 2018/19 with numbers still increasing. Senior officers have welcomed the news as a positive step in victims having the confidence to report it and it is hoped this will encourage others do the same. Detective Chief Inspector Eric Myers, who is the force's lead for Stalking and Harassment, believes that more people are aware of stalking and harassment and understand how important it is to report it to police. He said: "We have made significant improvements over the past few years in relation to how we deal with reports of stalking and harassment. "Our priority is making sure officers will listen to the victim, make appropriate decisions and most importantly take action to make sure the victim is safe. "All our officers have been specially trained to go beyond the surface and spot the signs of someone being stalked or harassed. "Quite often victims themselves may not even be aware of the extent they are being stalked as frighteningly, this can be happening without their knowledge. "Stalkers may be accessing messages or social media accounts or following a victim’s movements though digital technology or GPS tracking. "Stalking and harassment is more about someone causing another person fear, anxiety or distress. This could be through persistent messages, receiving unwanted gifts, showing up unexpectedly, finding they have gained access to your social media accounts or home smart devices. It could be that you notice that they may drive past your house or that you see them in places you wouldn’t expect such as work or school." A recent victim of stalking and harassment explained the signs she noticed when her ex-partner was harassing her. She said: "I met someone who initially was lovely. Very kind. Very generous. After a few months there were little things. He would have huffs and storm off. Initially I thought it was nothing. That got worse and worse to a point where I couldn't have a glass of wine because he would put salt in it. I wasn't allowed to go out. There was name calling. "I didn't want to be in that position anymore because I knew it was wrong. He then decided he was sorry but I didn't want to try again. I knew it wasn't right. That was when the following got really bad, I would go to work or shopping and he would be there. I would open the blinds on a morning and he would be driving past my house. "Everywhere I went he seemed to be there . At first I thought it was coincidence but as time went on I started to realise it wasn't right. I had nasty emails, threatening emails, threatening text messages." This week is National Stalking Week which is being supported by Police and Crime Commissioner Dame Vera Baird and Northumbria Police. The week is to raise awareness of stalking and harassment and urge victims to come forward. 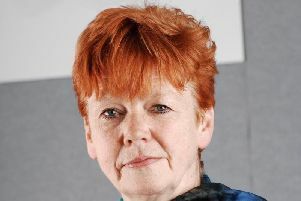 Northumbria Police and Crime Commissioner, Dame Vera Baird QC, said: “If anyone has been a victim of stalking, harassment or malicious communication, please don't hesitate to come forward to police. If you have been a victim of stalking, harassment or malicious communication please come forward and contact police on 101, or 999 in an emergency. Victims can also contact Victims First Northumbria on 0800 011 3116 who will give independent advice and support.